You’re bored, I can see it from here. All this summer is getting on your nerves and you’re longing for the knitting season again. I see. Hmm. Well. How about a knit-a-long (KAL)? Good idea, huh? Ok, so here is my proposal. You could, if you don’t have anything better to do, join my VERY FIRST KAL from AUGUST 14 to September 30 2016 in my Ravelry group. I am about to release a new Shawl and mittens set and will be hosting a KAL in which we’ll knit the set together. You can even win lovely prizes, can it get any better? Oh, wait, yes it can! If you’re a newsletter subscriber, you can get the patterns at a discount. I’ll mail out a coupon code the 14th of August, together with the pattern release note, so make sure to sign up before that! 🙂 Sign up for the newsletter here (top right corner). 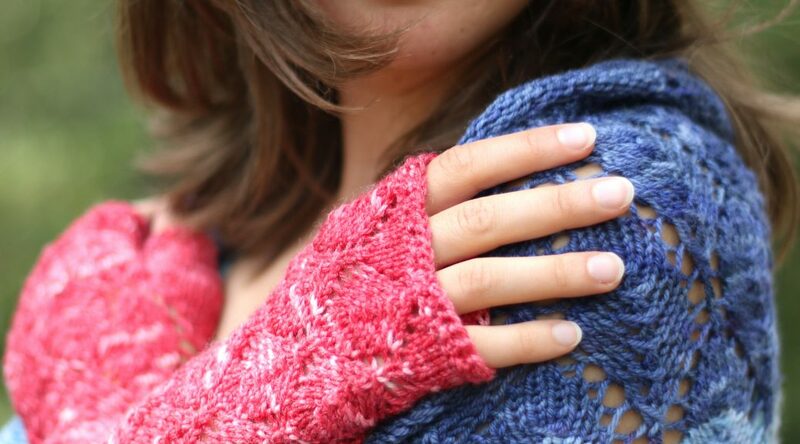 Fall in Love mitts made from Hearthside Fibers Baaboo Poinsetta, pattern to be released the 14th of August! One lucky Poster will receive one skein of the lovely BaaBoo, (shipping worldwide) at the end of the KAL. Don’t forget to post progress shots and tell us what yarn you’ll be using, too. Sign up here to cast on as the pattern is released the 14th of August 2016! welcher? Der Facebook Knopf? Wenn du den Mauszeiger über das Bild hältst, gibts die Share-knöpfe auch, das sollte gehen! Well, you’ll have to buy the pattern, which you would receive at a reduced price if you are a subscriber to my newsletter. Other than that, no, no cost.